The best thing about makeup is that you can always try things out before you buy them. Recently I’ve been collecting a few samples of things that I would like to buy but don’t want to pay full price for, before I know I like it. I thought i’d share with you a few products I’ve been trying out lately and tell you if id buy it or not. Charlotte Tilbury Light Wonder foundation (£32) –Buy. I am a huge fan of Charlotte Tilbury and I have always wanted to try out her Light Wonder foundation. I always like to try a sample of a high end foundation before I buy it, I like to test the colour match, how long it lasts on the skin and if my skin reacts well to the new formula. This foundation has the same amount of coverage as Chanel Vitalumiere Aqua and I love that foundation. Light Wonder has more of a glow than Vitalumiere Aqua and I love how radiant this foundation is. A definite buy. Sunday Riley Start Over Active eye cream (£65) -Not to buy. I’ve heard nothing but good things about Sunday Riley so I thought i’d try out their eye cream, as i’m always on the hunt for a good eye cream. However I was left disappointed with this one, the product itself is soothing and refreshing for the under eye area. But after application my eyes started to water and the product itself stung my eyes. Maybe the product contains something that i’m allergic to or my eyes are very sensitive to this product. I wouldn’t buy this. Jurlique rose water balancing mist (£18) -Buy. I have been loving face mists recently, as previously mentioned in this post. Face mists are so refreshing and smell amazing, this one from Jurlique is heavenly. Rose water smells so good and it feels even better on the skin, I spray this on my face as part of my morning and evening skincare routine. I would definitely buy this. 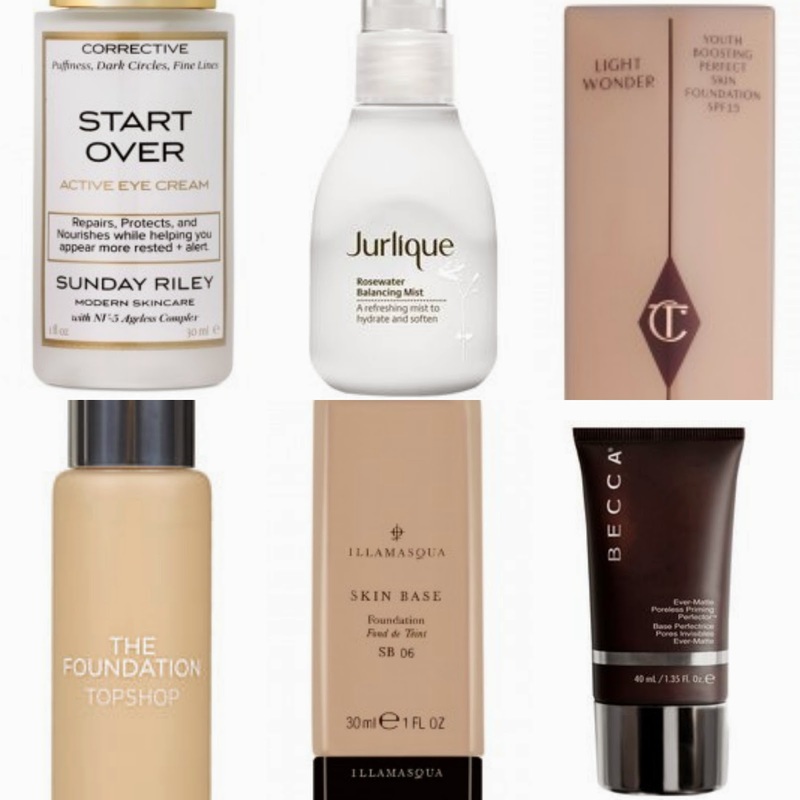 Topshop The Foundation (£16) -Not to buy. I love pretty much everything from the Topshop beauty range and I was excited to try out their foundation, however it just didn’t work for me. I have dry to normal skin and I found that this foundation was way too oily for me, it slid around my face and just didn’t sink into my skin. If you have oily skin then this foundation possibly isn’t for you. I won’t be buying this. Illamasqua Skin Base foundation (£32) -Buy. I have been wanting to try out this foundation for a very long time and I am so glad that I finally got round to it. The coverage is great, it can be sheer or build able for a more full coverage if preferred, I got matched to shade 6 and it is a perfect match. I will be buying this. Becca ever-matte poreless primer (£28) -Not to buy. I haven’t really got anything bad nor good to say about this product, I just think that it is over priced and they’re are perfectly good drug store dupes for half the price. I’ve been using The Body Shop all-in-one insta blur (£14) for a while now and when I tried the Becca one I couldn’t really tell a difference. I wouldn’t buy this purely for the fact I already have a cheaper alternative thats just as good. Have you tried any of the products I mentioned? Let me know.